Well Christmas was a fair few months ago but the weather has been horrid! At the time of painting these the UK and Northern Ireland were experiencing floods and snow. Nails Inc - Marylebone Lane is one of the first Nails Inc polishes in a long time that I've lusted after. I got this in their Christmas Crackers at Christmas and I was able to pick them up for £19.50 because I'd had a treatment. 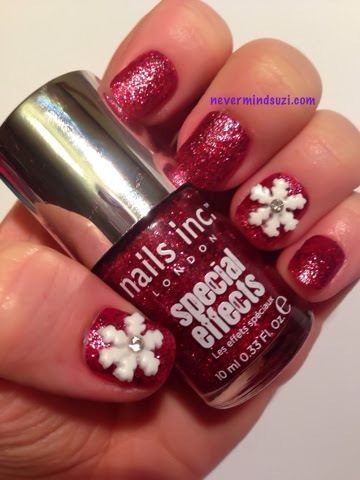 Marylebone Lane is a dense ruby red glitter, I'm wearing 2 coats over pink Allure press-ons. This colour is just so lush! And I added some cute snowflake decals. The likes of which can be found at Born Pretty Store. They offer free worldwide delivery and by applying the code STPX31 you get 10% discount of full price items.